There’s a lot of new Medicine Hat websites coming out these days. A sign that Medicine Hat might be embracing the times? 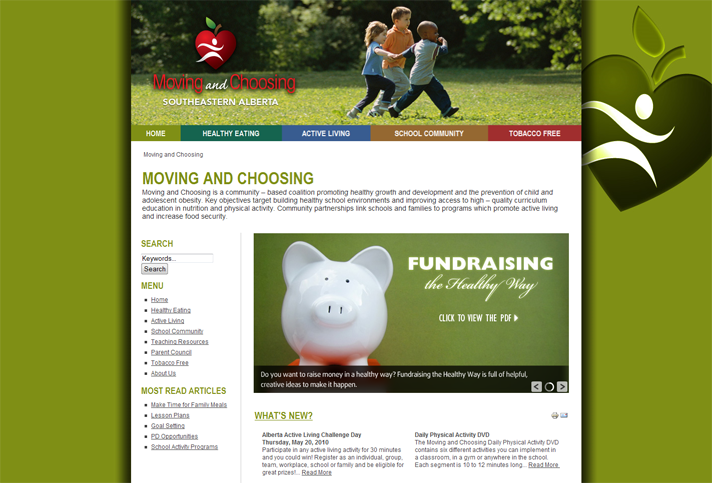 Either way, it doesn’t really apply to Moving and Choosing, an initiative of “Be fit for Life” and Alberta Health Services because they have had a website for a long number of years already. This post is about their new one which focuses on an updated design, branding effort and other optimizations of the sites content and focus. The home page – where you can see new things happening on the site and within the program. The “What’s New” section is updated regularly and features updates to the site and other related resources. Healthy Eating – A section dedicated to healthy eating articles, tips, and an events calendar that lets you know about any healthy eating meetings, talks, presentations and more. Active Living – Active Living recognizes the joys, values, & benefits of all types of activities. About staying active and getting in shape. School Community – Definitely the largest section. Once you enter it, you will get access to a drop-down menu which features the bulk of the sites content: teaching resources, teacher profiles, submission forms, success stories, parent council, newsletters and more. Tobacco Free – Tobacco use is the leading cause of preventable disease and death in Canada and most other developed countries. This section features some resources on being “tobacco free”. This entry was posted on Tuesday, May 18th, 2010 at 8:17 AM and is filed under Websites. You can follow any responses to this entry through the RSS 2.0 feed. You can leave a response, or trackback from your own site. Haha, maybe a little bit of both? Yes, either way is better than being 20 years behind the times.